Every single day as I traveled to work, I noticed this man on the pavement. Days turned into months; months into a year.. winter, summer came by and then the rains, this man was seen there at the same location, as if nothing ever changed. It often got me thinking deeply about life and its ways and what it offers to each one of us. One day I finally stopped the car and sat with him on the pavement and got talking to him.This meeting lingered in my mind for long and today I am keying in to share my thoughts. We are so often bombarded with motivation messages that admonish us: “Think Big”, “Dream big”, “Climb the ladder "...And do all this NOW! Does everyone reach that pinnacle of his or her life? Not everybody is meant to make it “big.” Not everybody has the ability to do multitasking all day long. Not everybody wants to have “a crazy, busy day”. Not everybody wants to devote their energy to dig the gold. We like to do a lot of things that have nothing to do with making it big or being on top. And that’s a good thing. Obviously, we can’t all be at the top. If this article is resonating with you, it’s time to make a shift in how you allocate your attention. Begin with enjoying the little things in life. 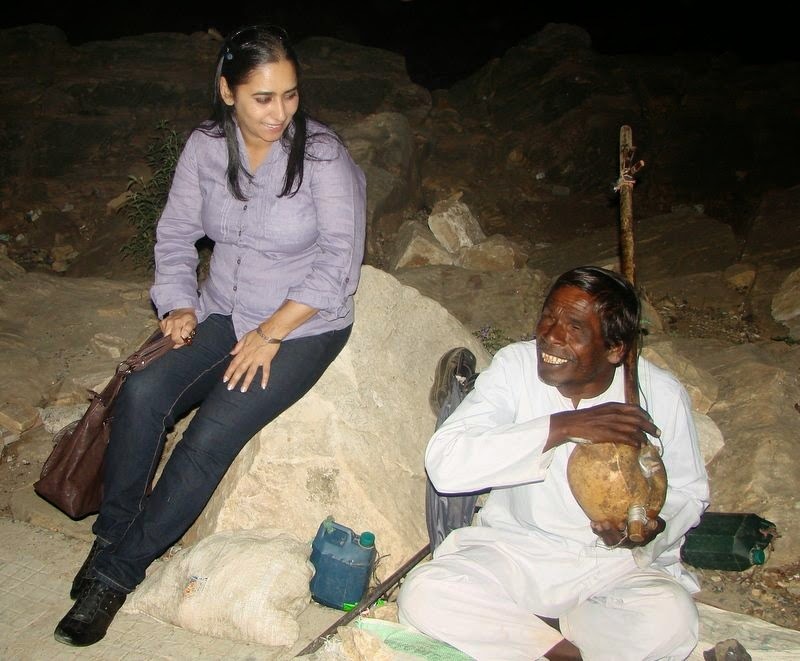 This man sitting at the road side was a reminder to pause and enjoy the little things in life. 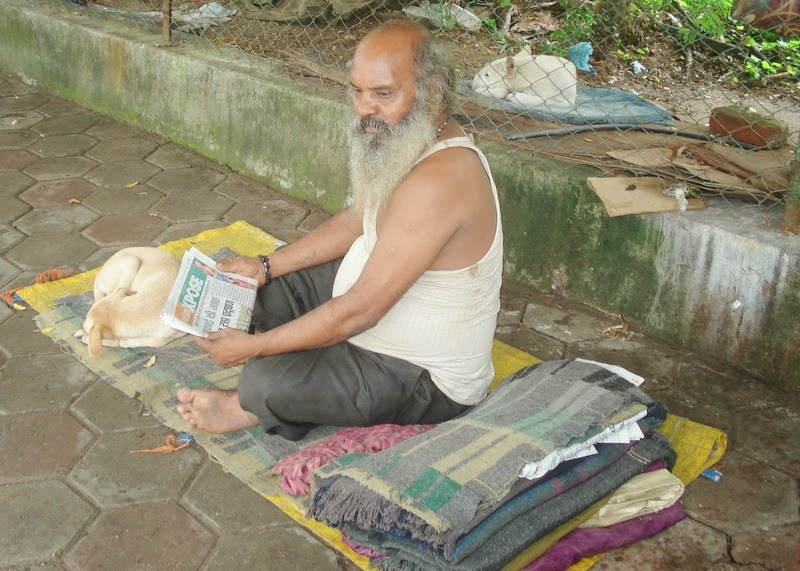 He has no home but has a simple mat and a sheet to sleep on which he shares with two stray dogs that always wag their tails as he feeds them with whatever he eats and also offer them a cosy bed. 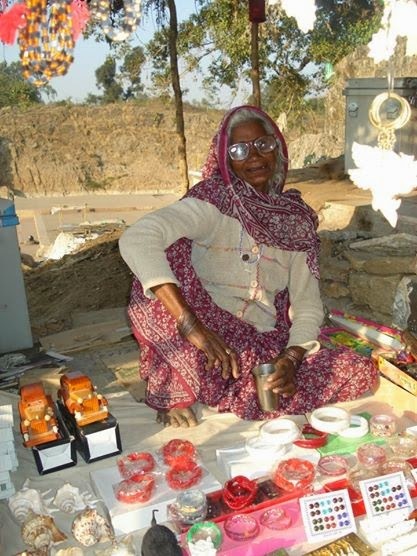 If we look around we can see how some people with so little in hand can adorn a million dollar smile as this old woman who sits whole day selling little things. Her smile captured my heart ! We can only bring real light to the lives of such people by including them in our plans for progress and prosperity. The fact that we can be comfortable shopping, spending, or earning huge salaries while so many families in our country make out a living on Rs. 20/- a day is the most disturbing thought. Try and highlight the achievements of such people, whom we come in contact with each day. Write about them and their noble qualities in community journals and groups. The resulting tributes from the community can be collated and handed over to the relevant person along with a certificate of appreciation from the community. This will go a long way to upgrade the market value of the underprivileged.They would thus gently, seamlessly get woven into the mainstream of our 'privileged' society. I can't imagine only one person can do so, that too in today's milieu. So lets join hands and and let this not be a “a single day affair”, rather make a point to continue the habit through out the year. Let this be an ongoing thing! Most of the time we tend to think of life nothing more than the passage of days, weeks, years and decades. But, in essence, life is made up of moments. so take a breather and think as you reflect on your day, what moments stand out for you? Is it the stress of trying to do it all? Is it the stuff that didn’t get done? Is it the disappointment in yourself for what you forgot to do or failed to do, or a gloomy feeling about how far you are from the top? If so, then people, it's time for you to pause, to make a shift. Each day, pay attention to at least one or two moments that worked out well for you. Don’t just shrug your shoulders and conclude that “it was just another day. Nothing worked out for me.” Even a bad experience has a valuable moment wrapped up inside, if only you‘re willing to dig deeper to discover it. The constant barrage to “DO more,” “GET more,” and “BE more” negates what you have done, what you have and who you are. In this competitive world of ours, often remind yourselves of what you have accomplished. And we always need to remind ourselves to be our best friend. Open up to experience these little moments of joy that life has to offer! When we practice greeting the world with awareness we begin to tune into things, little things, happening all around us. And we wonder….how many other miracles like this one are unfolding under our noses while we’re just too busy, too self-absorbed, too unaware too unaware to experience the niceties of life! Humility in Leadership goes a long way..Lets Grow Humble leaders ! Aren’t leaders difficult to be around if they always have to be the perfect man around. Leadership is often thought or even taught that it requires a person to be very pushy, aggressive and must stand out amongst any possible competition. If one can strip away the Mr know all attitude , pretension, and superiority, one can surely show the human side. The pursuit of perfection in fact can get in the way of developing the appropriate blend of humility and passion. But for too long, the dominant archetype of leadership have centred upon being a passionate leader—decisive, powerful, driven, self-assured, fearless, ruthless, risk-taking, and so on. What makes humility such an interesting and challenging topic in leadership is its seeming dichotomy with many of the more traditional “strong leader” characteristics stated above. For leaders to develop to their full potential, there is a need to integrate humility with the more traditional leadership characteristics like charisma, drive, professional will, courage, and determination. It is precisely the co-existence of these two seemingly opposite characteristics that leaders must strive to achieve in order to develop their full potential for long-term leadership effectiveness. Are you alarmed by the humility deficit in many leaders? Are you in awe of the truly humble leaders who deflect the credit to others. I believe it requires humility to truly be a great leader. 1. Build Faith: We need leaders who are confident enough to not need to talk about it rather show the confidence to believe in their team. 3.Let them step out of their Comfort Zone: Give them a project in an area they know nothing about. This experience could be really humbling. Put them in arenas where they must rely on their team or peers to be successful. 4. Empower them to manage their blind spots: Hire a coach for them. Encourage your team to surface and work through their own conflicts & constrains. 6. Add Humour to Work:If you can laugh at yourself it tends to minimize status distinctions between you and the employees.It has an equalising affect and makes a leader look just like everyone else. It is humanising and puts others at ease. It fosters an upbeat atmosphere that encourages interaction, brainstorming, and creative thinking. All that leads to greater productivity. You could be a leader in corporate sector or heading a school or an entrepreneur, everywhere you need to be a leader who is approachable, who has a broader vision of the term leadership and lets others be leaders too. each level and create leaders ! Are you in a relationship and your partner has to move to another city or country .Or, you fell in love with someone not in the same city as you are in. Welcome to the world of missing, and a lot of missing! Here are so many reasons why LDRs are mostly cringed upon. There is no cure to this -_- You’ll always miss your partner no matter how much time you guys spend on Skype, FaceTime, WhatsApp. Say hello to being sleep deprived all the time! If your partner is in another time zone, both of you have to make adjustments to sleep patterns to talk to each other and stay in touch. Pretty much. You’re either texting on your laptop, your phone, or you are on your web camera, your internet connection becomes your lifeline. Unless you’re the kind that is okay with having virtual dates – watching the same movie on respective laptops and sharing comments via texting, or being on phone while the movie runs. Even if you try and plan your sweet meets …they never seem to work out. Because you are hundreds of miles away. Even if you go with your friends, sight of one couple holding hands is enough to trigger the waterworks. Every song being played reminds you of the love that flows. Your relationship becomes a pot of fights, resentments and more if you guys have trust issues. Every new like on a new selfie triggers the Sherlock Holmes in you. Just because you are unable to meet may cause trust issues. Sometimes all you need is a hug, but no, you are unable to get one . Skype doesn’t let them touch you. You’ve to hug yourself to sleep, which is pretty sad if you are in a relationship. You got to do with virtual hugs ! Happy Valentine's Day to all ! Sometimes there is a story teller within us who keeps repeating the same old story. It seems like an old vinyl record that gets stuck and repeats the same thoughts over and over and we are in constant fear of something that we don't want in our lives. We all go through this at time or the other. We lie awake night after night thinking of losing our someone special, or worrying about our children, our health or the finances & future. Instead of blocking these thoughts we keep bringing our focus on these thoughts and they engulf our peace & wellness. The most troubling aspect of thought loops is the non-recognition of the happenings... our entry into the loop. The challenge being that these loops are embellished with strong emotions. Do the emotions trigger the loops, or the loops trigger the emotions? Are there any specific techniques to halt this endless repetitive cycle. Let go of fear today. Stop these thoughts. Recognize the story that you’re telling yourself about each scenario. You stories are limiting beliefs that you create, repeat and live out day after day. “It will never work out for me." These fear-based beliefs are false. They cause you to suffer. It's an empowering choice that will set you free. Learn to recognize the storyteller in your head. Are you willing? Willing to change the storyteller or do you want to be addicted to the old stories and the same drama of self-destruction? When you change your story, you change your life. The beauty of your story is that you are the author. Give yourself permission to rewrite it. Be the leader of your life ! Tell yourself the story that inspires you!